My son graduated from Kindergarten last weekend. The school didn’t do the caps and gowns ceremony so popular these days (which I’m fine with), but I didn’t want it to go entirely unnoticed. He asked if I could make cake for him and a few of his friends in the neighborhood. Obviously a tough sell for me. Since I’ve been on an animal cake kick lately and his school mascot is the most badass animal, I figured I’d continue the trend and make a fox. Except I didn’t have time to bake a cake. 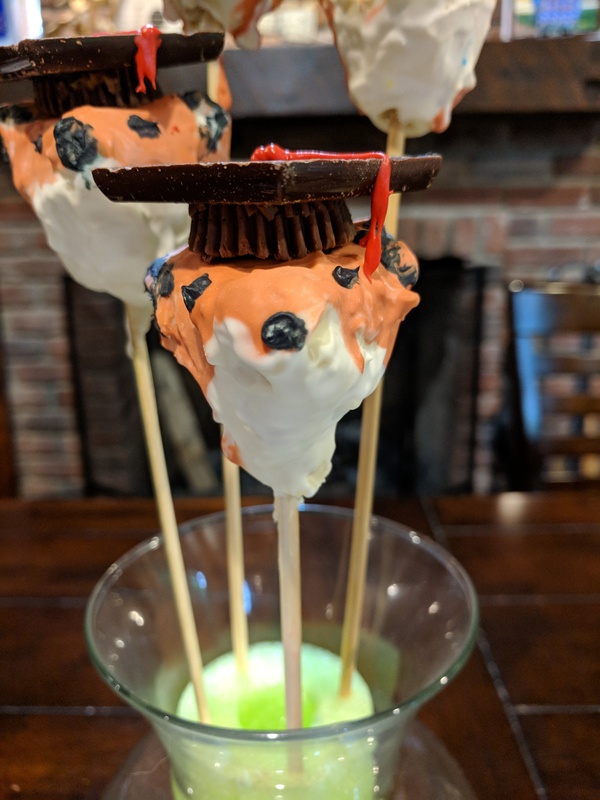 I did, however, some leftover cake in the freezer from which to make cake balls, which I figured could be shaped into roughly fox-head shaped masses, one for each attending graduate. The one store I had time to visit did not have any white compound chocolate, candy melts, or white baking chocolate (#Targetfail), so I had to make do with what I had: 11 squares of white chocolate, some royal icing, rainbow sprinkles, and (I’ll admit it) store-bought white frosting. So I had to temper chocolate again. My issues with tempering chocolate tend to arise from overheating it: partially from using a glass bowl in my double boiler, which holds heat too long, and partially because I’m just not good at it yet. I got a metal bowl and this time erred on the other side, not getting the chocolate quite hot enough. 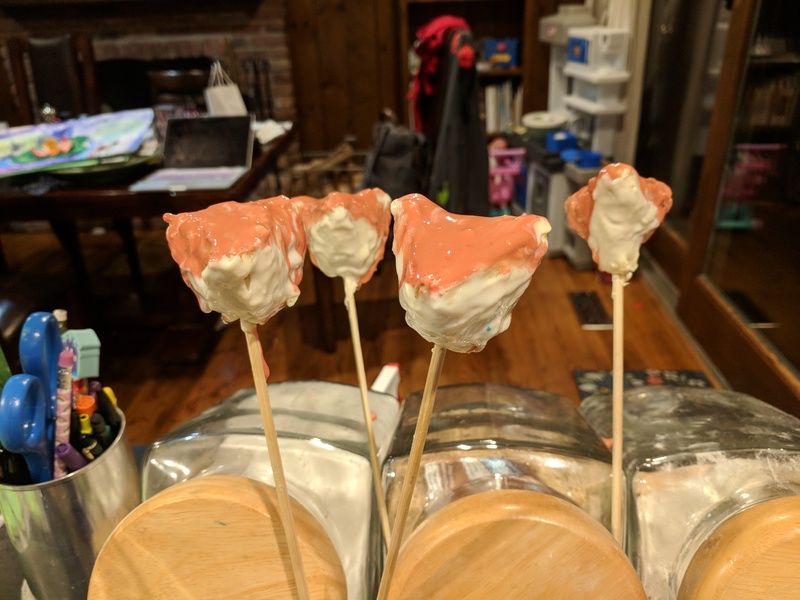 The good news is, it tempered, but I ended up with some pretty misshapen fox heads as the chocolate cooled and hardened before I could smooth it out. Food coloring in chocolate takes some extra steps to keep the chocolate from seizing, so I used the easily tintable royal icing I had from the cookies I was also making for the weekend (baseball end-of-season party) and hoped it would stick to the chocolate. It did stick, but unfortunately I was covering a rough surface. At first I was globbing the icing on, which just made the heads more uneven. When I started using my flat-bristled brush to paint the reddish (red + yellow gel coloring) fur on the top of the head things got a little better, but still a little goopy. [Finally a photo!] The poor fella on the left has the worst combo of lumpy chocolate and drippy royal icing. 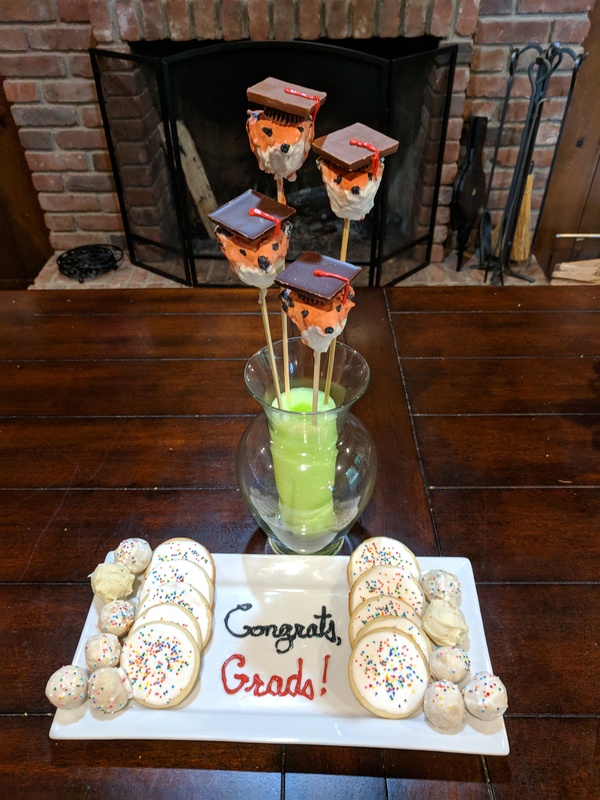 Ghirardelli chocolate squares on top of halved mini Reese’s cups glued with frosting made the mortar boards, with a little red and black frosting for the tassel and facial features, respectively. 11 squares of chocolate only covered the 4 foxes plus 2 additional cake balls, so I dredged the rest of the cake balls and a few cookies in royal icing and added sprinkles. Sprinkles = party.